I am of the "loves me some seals!" club, even when they muck up the viz. They're so cute it's hard to be mad. That's stinky ... The seal... He is around a lot at night.. last winter there were 4 seals Total .. glad you had Fun ! Nice! Yes, those dad gummed things can be so fun to see, unless you are trying to take photos of something, then they muck it all up! But always fun to see. 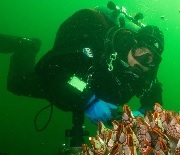 Went on a night dive last night at the Mukilteo T-Dock. In the past I get just a glimpse of a Harbor Seal from time to time. Last night we saw two of them and they both are much more comfortable with divers. As with Cove 2, Harbor Seals can screw up visibility, but it was fun having them dart about, one time even bumping into me (I turned to see if my buddy was tapping me, she wasn't). Oh, and by the way the Ranger hired by Mukilteo was checking for parking passes.